We love them because they purr, they are soft and furry, they can guess when we’re upset and generally make our lives happier. We can’t stay mad at them for more than thirty seconds and we even praise them when they break, chew or scratch something precious. Yes, I am talking about our dear feline friends. I’m going to tackle a particular subject that most cat owners dread and should be avoided, if possible: how to travel with a cat. Cats are very sensitive to the smallest changes, and, as a consequence, they are not keen on traveling. They dread any change of environment and can become highly stressed if they are constantly being moved from one place to another. 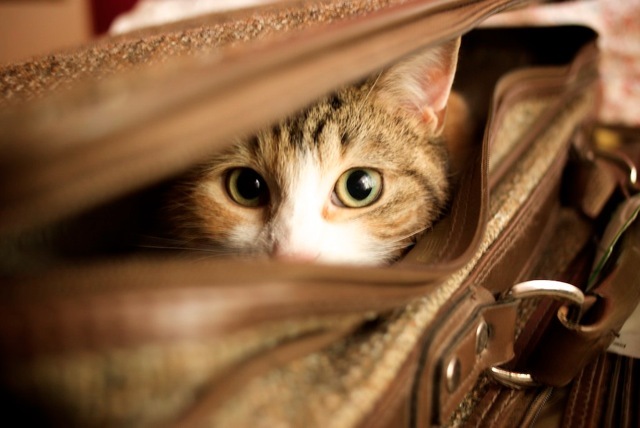 If you’re planning a short holiday, you shouldn’t even consider bringing your cat along. Instead, ask for a friend, family member or neighbor to cat sit for you. A week of living almost by itself in the house, with the occasional visitors, is much more preferable for your cat than a nerve racking two-hour flight or journey by train. But if you can’t avoid taking your cat with you when you travel, you’ll have to pay a lot of attention to preparations and allow your cat enough time to adjust to every change. We’ll walk you through every step, so you can be prepared when you have to pack up and relocate. Whether you choose to travel with your cat by car, by train or by plane, there are certain things you have to take care of before leaving. Food – you’ll want to feed your cat three or four hours before embarking on your journey. This way, your cat has enough time to digest the food and feel better during the journey if it experiences motion sickness. Blanket – creatures of habit, cats dwell best in familiar circumstances. To make their journey slightly more enjoyable, make sure you put a familiar blanket or toy to remind them of home in their carrier. If your cat usually kneads or purrs on your clothes, you can even use a t-shirt that smells like you. The familiar scent will soothe your pet and help it be less stressed in the car or on the plane. 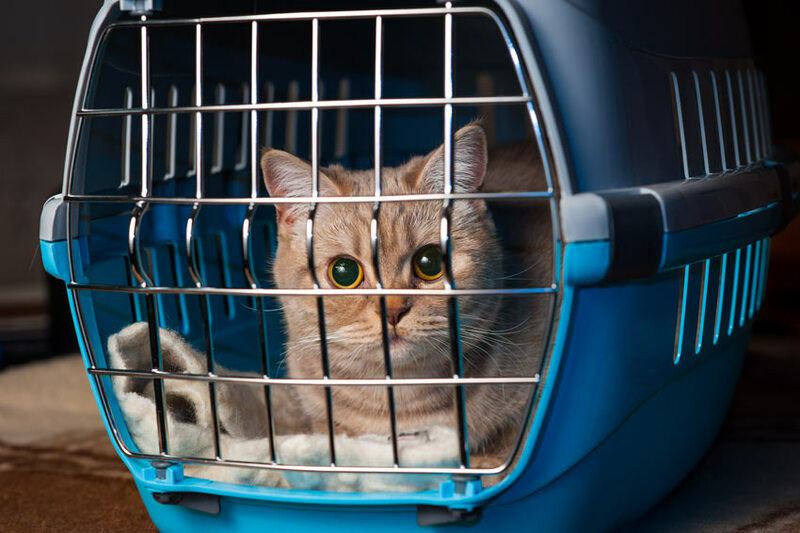 Stable carrier – your cat doesn’t necessarily need to have motion sickness to dislike the wobbling effect an unstable carrier gives in a moving car. Make sure you position its carrier in a safe place where it can’t topple down if you suddenly hit the brakes. If it’s possible, place the carrier so that your cat can see you. Fastening the cage with the seat belt is the best solution to keep it from moving and making your cat more comfortable. Routine – cats thrive on a fixed schedule, so it’s important to stick to the routine no matter the circumstances. If the journey allows it, provide food and water for you cat following the schedule when you would normally feed it. If you’re travelling by car, allow your pet to have a playtime break whenever you stop to stretch your legs. Open windows – your cat will be grateful if you crack open a window and let the fresh air in. However, you should be very careful if you leave your cat roam the vehicle with open windows. It won’t miss the opportunity to jump out of the moving car. Allowing your cat to play around in the car is not recommended, since it could distract you from driving and possibly cause accidents. Travelling by plane is scary for some people, so we can only imagine how it feels like for a cat. If you’re preparing for air travel, and you need information about how to travel with cats by plane, take note of the following to-dos. Each airline will have its own animal policy. Make the appropriate inquiries about your pet before booking the ticket. Find out all the needed information: is the cat allowed to travel with you, or does it need to go in the cargo area? If you can choose between the two, keep your cat near you. Ask whether you need a special carrier, and find out if there are any medical requirements or any extra charges. Prepare an identification tag for your cat. This should include your full name and your telephone number, as well as the microchip number of the cat and your destination. Before buying your tickets, carefully consider the weather. A hot Sun in the summer or freezing temperatures in the winter might force you to leave your cat behind. You should also think about stops and layovers. In order to avoid your cat being moved from one plane to another, book a direct flight. Let the flight crew know you’re not traveling alone if your pet is in the cargo. This way, you’ll have someone to check on the cat in case of delays. If you can choose between travelling by plane or car, you might want to go with the latter. It’s not going to be a piece of cake for you, but it’s going to be easier for your cat. Here’s what you should keep in mind. Get your cat used to the car before the big trip. You can start taking it for short 30 minute rides several weeks before the journey. Offering cats treats in the car will help as well. If your cat has motion sickness, get a prescription from the veterinarian. If the cat is a particularly nervous traveler, talk to its doctor about a tranquilizer or a sedative. Do a trial run with these at home to make sure you’re not taken by surprise by side effects on departure day. Make the cage look more welcoming and less hostile by adding a familiar toy or a towel that smells like your cat. 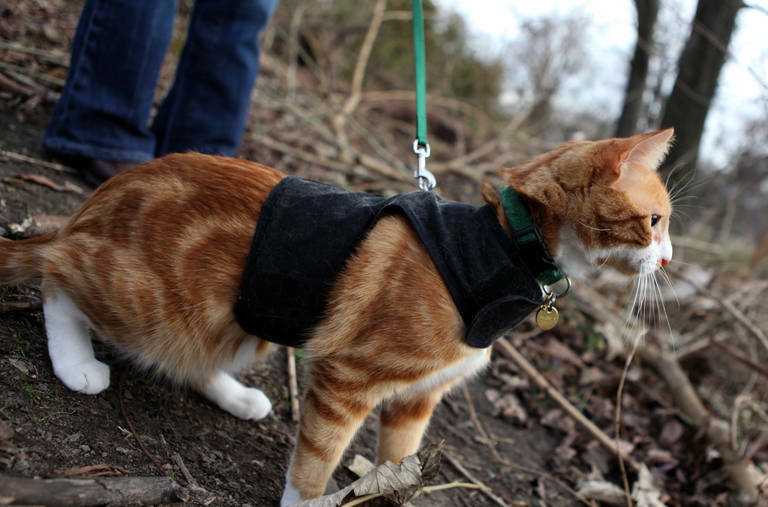 Pack a harness and a leash for breaks. It’s unpleasant for the cat to stay boxed in for five hours, so consider making stops along the way and allowing the cat to stretch its legs outside. To make sure it doesn’t make a run for its life, use a leash and a harness.